When hearing about Independence Day and the Declaration of Independence, little is said about two of the founding fathers, John Adams and Ben Franklin. These two are known in history for other accomplishments. But without the hard work and dedication to a different way of life that these two founding fathers had, we might not be celebrating Independence Day. John Adams fought for our country’s independence, and in spite of the hard battles ahead he never wavered in his support of our nation becoming free from Britain’s rule. Because of how dedicated he was to our nation becoming free, John Adams risked being executed. He was considered a traitor to the Crown (England). John Adams risked everything, including his life, to see our nation become independent, which is why we celebrate the Fourth of July. John Adams was actually a delegate to the Continental Congress, which was one of the hardest jobs he could have faced in 1776. In 1776 John Adams was trying to convince some of his fellow delegates that America would be better off separated from England. During this time that was not an easy job because the American Revolution was in full swing, and many people were against opposing England; they felt it would be better to stay part of England rather than branch out on their own. But John Adams was finally able to convince all twelve of his fellow delegates that becoming independent was the best course of action. On July 4, 1776 there was a unanimous vote to make America an independent nation by adopting the Declaration of Independence. Ben Franklin is another founding father of the Declaration of Independence and played a major role in getting the Declaration of Independence approved and adopted by the Continental Congress. Ben Franklin’s mission was to secure France’s help, both financially and militarily, in America’s fight against Britain. His job was as hard as John Adams’ because both of them had to use their powers of persuasion to convince others that opposing Britain was in everybody’s best interest. In order to convince France to join the colonies in their fight against England, Ben Franklin had to use skillful diplomacy, and he also had to employ the use of spies. In the end, he almost single-handedly was able to convince France to join America. Luckily Ben Franklin was successful, which helped the colonies win the war against Britain. Both John Adams and Ben Franklin were two of the five people who were asked to write and consult on the Declaration of Independence. And because of their hard work and dedication to the Declaration of Independence we are able to celebrate the Fourth of July every year. 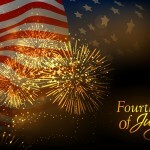 In fact John Adams predicted that every year after the Declaration of Independence was signed people around the United States would celebrate with fireworks, music, toasts, speeches, etc. And he was completely correct. In 1776 after the Declaration of Independence was signed many places had modest celebrations because the war was still raging on, but the celebrations were held after the document was signed. 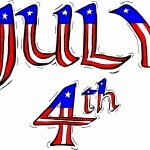 The first really organized celebration was in 1777, a year after the Declaration of Independence was adopted. The celebration was one of the most elaborate celebrations and had many elements that would be included in future celebrations. 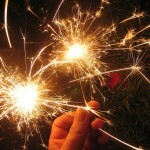 In fact our modern celebrations have only been modified because of the changes in technology. Back in 1777 they used cannons for fireworks, but everything was still decorated in red, white and blue. Learn more with these Declaration of Independence websites. "How John Adams and Ben Franklin Helped Independence Day." Surfnetkids. Feldman Publishing. 29 Jun. 2007. Web. 21 Apr. 2019. <https://www.surfnetkids.com/independenceday/227/how-john-adams-and-ben-franklin-helped-independence-day/ >.